Quadrax Loudspeaker Cable- Factory Terminated. 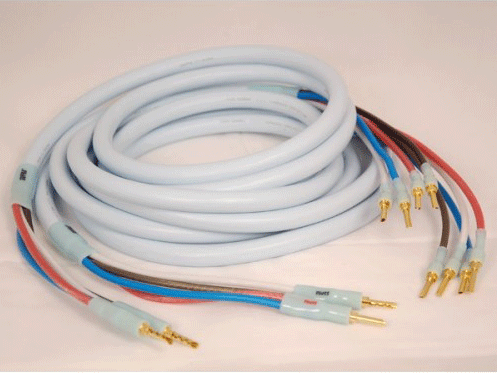 2M to 4M pair in standand, bi-wire, or bi-amp. Affordable High-End High Definition Tube Conductor Star Quad 4 x 2.0 sq mm Loudspeaker Cable. 2M default. Supra Quadrax- Factory Terminated is a tin plated quad coax construction speaker cable. Available in various length with multiple terminations. The tube conductor design increases the relative surface area which helps lower the inductance. Star Quad configuration reduces RF pickup and increases immunity to all kinds of interference. It also lowers the inductance. The special PolyPropylene (PP) insulation is extremely stable and has low capacitance. The PP insulated tin plated quad coax construction contributes to a better sound quality by minimizing the skin-effect and making less current jumps between the wire surfaces. SUPRA Quadrax is made with short pitch twisting for low inductance and low radiation. The tube conductor design increases the relative surface area which helps lower the inductance. Star Quad configuration reduces RF pickup and increases immunity to all kinds of interference. It also lowers the inductance. The special PolyPropylene (PP) insulation is extremely stable and has low capacitance. It is also environmentally friendly. Quadrax has a very low inductance of 0.3 uH/m. One of Supra Cables very best loudspeaker cables. Terminated with Supra Combicon connectors at both ends. 2 to 4 plugs for Single-wire, bi-wire, or bi-amping options. Quadrax has all the necessary characteristics of becoming a future-classic SUPRA Cable. It is a fusion of techniques that perhaps is best described as four Star Quad-configured, one-layer-spun on insulating core, multi-strand conductors, leaving the inductance, noise pick-up and signal degradation so low, it has never before been available at this price level! By spinning a multi-strand layer on an insulating core, we increased the comparative conductor cross section, leading to an inductance as low as 0.3mH/m, one of our hallmarks. The result is dynamic, transient rich and transparent. We also optimized the strand spinning direction of each conductor to further enhance the low inductance, timing and interference immunity. Finally, this cable also offers low capacitance, a very rare combination of characteristics. Thanks to its cable geometry and high grade polypropylene insulation, the high frequency drop-off is negligible minimizing the need of any frequency compensation. This is a cable we are truly proud of and one we feel will be a worthy contestant in any Hi-Fi system. Or Hi-Fi test.